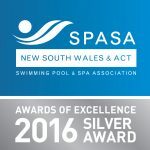 Nepean Pools were awarded Best National Dealer for two consecutive years by Aqua Technics and won the Master Builders Fibreglass Pool Award for the last two consecutive years. Along with numerous SPASA awards with 3 Silver SPASA Awards for 2016 and both multiple Silver Awards and a Gold Award for 2017. Thus continuing to showcase our dedicated service to our customers and the fibreglass swimming pool building industry.